Latest. Click site name for data. The Indian River Lagoon (IRL) is situated along 156 miles of Florida's east coast. Urbanization, excessive freshwater releases, degradation of water quality, contaminant loading, loss of habitat (e.g., seagrasses, mangroves), harmful algal blooms, decline of fisheries, and emerging diseases in marine mammals and other biota are increasingly important issues in the IRL, as they are throughout the world.s estuaries and coastal waters. 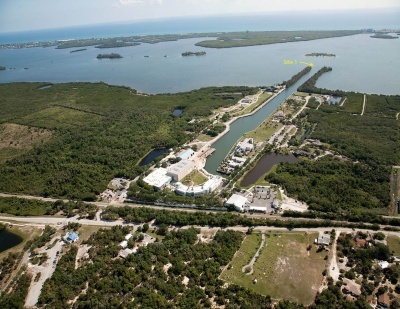 The Indian River Lagoon Observatory (IRLO), based at Florida Atlantic University's Harbor Branch Oceanographic Institute, is conducting long-term, multi-disciplinary, ecosystem-based research on this nationally significant estuary. IRLO research and education activities are being enhanced by the deployment of an estuarine observation network of land/ocean biogeochemical observatory (LOBO) units and weather sensors to provide real-time, high-accuracy and high-resolution water quality/weather data through this dedicated interactive website. The LOBO network enables researchers to follow environmental changes in the IRL, assist resource and planning managers to make informed decisions, model and correlate environmental data to biological, chemical and physical phenomena, and contribute to education and public outreach on the lagoon. Currently LOBOs are deployed at nine sites in the IRL and St. Lucie Estuary (SLE). Four sites in Indian River County and St. Lucie County are made possible by funding from FAU Harbor Branch, a grant from the Harbor Branch Oceanographic Institute Foundation, and grants from Florida's Save Our Seas specialty license plate. Five sites in the St. Lucie Estuary (SLE) and nearby IRL are funded the 2014 State Legislative Budget through the Florida Department of Environmental Protection (FDEP). A tenth site, made possible by the South Florida Water Management District and located in the SLE, will be deployed by the end of 2015. All of these sites are ecologically important because of the dynamic interface between oceanic water from the inlets with freshwater inputs from the river, canals, and Lake Okeechobee. Place cursor over icon for station name. Use LOBOviz to graph and download archived data from this LOBO node.